Tax day was on Wednesday, and if you watch the news, you know that a bunch of people gathered in various parts of the country to hold a "tea party" to protest what they see as unfair taxation. I'm all for the right to protest, and I strongly encourage it, but this disingenuous display of "patriotism" is so sickening, it pushes the boundaries of reasonable civic-mindedness. 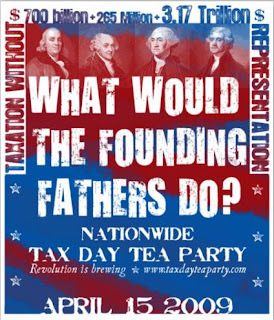 Notice the sign above, it's reliance on the revolutionary phrase, "no taxation without representation," and its rhetorical stance, "What would the founding fathers do?" Did anyone even think about the whole "representation" part of this protest? Unless you live in the District of Columbia (and they have a legitimate gripe), everyone has congressional representation. If you don't like the tax codes, then contact your representative and/or vote him or her out of office. This shrill cry about representation is not only a sad commentary on the gullibility of certain people, but it's a bold-face lie. What is more, did anyone attending these tea parties stop to wonder where this large deficit, and our current financial woes, originated? And it only gets worse. I found this sign/ad on website called The Community Organizer, whose subtitle is "United Against a Socialist President." ??!! Do these yahoos even know what socialism is? And there are many similar right-wing organizations out there. This particular website is filled with disinformation and even offensive material. For instance, they're advertising a chia head with Obama's face (along with racist undertones) with the words, "Show Barack the respect he DESERVES!" displayed underneath. If this weren't so offensive, this would be really, really sad. The Community Organizer screams at the top of its site, "Don't be a sheep, be an American!" And therein lies the greatest irony of all.